Fred Couples competed on the PGA Tour and the PGA Tour Champions. A former World No. 1, he has won 64 professional tournaments, most notably the 1992 Masters Tournament and the 1984 and 1996 Players Championship. In August 2011 he won his maiden senior major at the Senior Players Championship and followed this up in July 2012 when he won the Senior British Open Championship. He was inducted into the World Golf Hall of Fame in 2013. 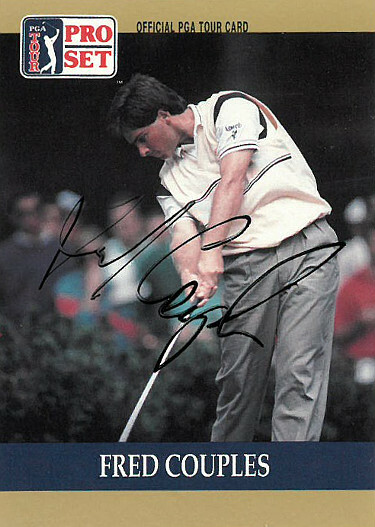 Fred Couples has hand signed this 1990 Pro Set PGA Tour Trading Card #53. Certificate of Authenticity from Athlon Sports Collectibles. Image of actual item instock - as shown/ as is.